Though the Evangelical Lutheran Church of St. Philip began as a storefront mission in 1893, today, September 27, is the official birthday of St. Philip. (From what I can gather, the official paperwork was signed on 27 September, A.D. 1894.) St. Philip’s beginning occurred during a fascinating time in American history. 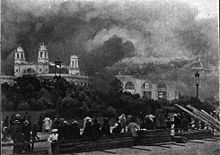 1893 saw the operation of the great Chicago “World’s Fair” or “Columbian Exposition” (May 1, 1893–October 30, 1893), but during the Exposition’s first week of operation, the economic “Panic of 1893” would begin. Because of the Exposition, the Panic of 1893 was muted at first in Chicago, but the city got a foretaste of trouble to come when, the night before the Exposition’s close, Mayor Carter Harrison was assassinated by a disgruntled job-seeker. 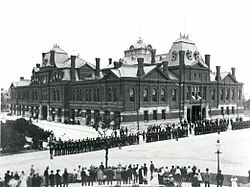 In 1894 the economic panic led to one of the most significant labor disputes in American history, the “Pullman Rail Strike,” and the city was further rocked by the the fiery destruction in July of many of the Exposition’s buildings. The strike was over by the fall of 1894, and the city had lost much of her Exposition’s “White City,” but it was very much a city “on the move,” a bustling, battling “boxing ring” (as a historian I heard describe it) of ethnic enclaves, masses of people striving in ways both sacred and profane, to secure a better future for themselves and their children. Indeed, it may well be that—considering these things—Chicago is the most thoroughly “American” of cities. For 117 years this is what The Evangelical Lutheran Church of St. Philip has done. We are now in the midst of circumstances with certain analogs to our beginnings. This modern confluence of circumstances and anniversaries has the people of St. Philip remembering their beginnings and renewing their commitment to the mission that Philip began with a simple yet profound proclamation and invitation. This entry was posted in Chicago, History, St. Philip, St. Philip Lutheran Church, History. Bookmark the permalink. What a great post. It seems like we should have had the History Fair topics be related to the founding/ closing/reopening of St. Philip (school) and church/ depression era and its impact on our school/church etc. oh well… fabulous post anyway!